Home/Corporates, General/Innovation in CPG: more Data or better Experience? In our constant quest of bridging the world of traditional industries with the magic of innovative startups, this week we take a deep-dive in the complex world of CPG (Consumer Packaged Goods) and Retail. While this is a world where innovation is (for the most part) incremental and the tsunami looks still as a harmless wave, there are definitely a number of areas where incumbents are starting feeling the pinch. However, if you look closely, all the new solutions that we are seeing in the market mainly have two things in common: they increase the customer experience while (or because) they allow companies to have more data about consumers. 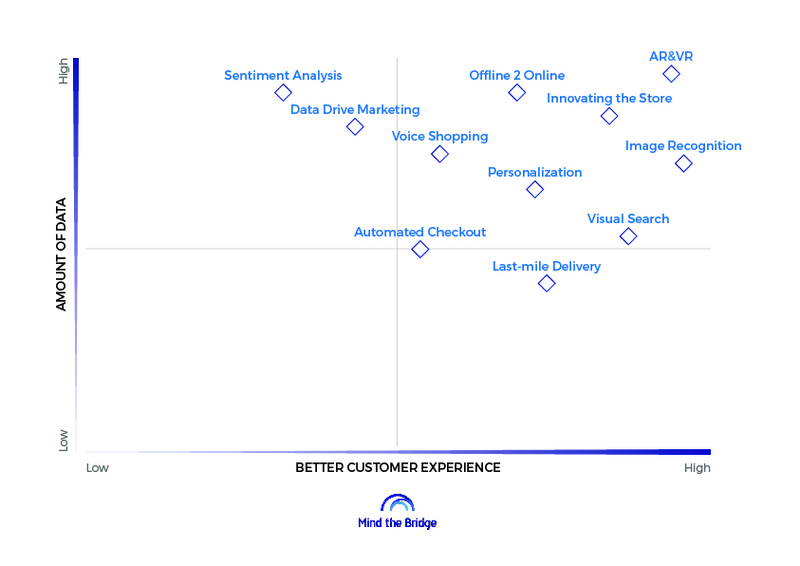 “Customer experience” is today’s new holy grail for what used-to-be a “good product”. Brands are increasingly shifting their focus away from the mere product push, moving to a more holistic sense of “customer experience”. This should include the entire cycle of experiencing a product rather than just using it: from the packaging, to the digital engagement, to the community aspect, all the way to its carbon footprint. To add to it, the value of the “experience” gets amplified in the digital world. As Jeff Bezos says, “If you make customers unhappy in the physical world, they might each tell 6 friends. If you make customers unhappy on the Internet, they can each tell 6,000 friends”. Data, on the other side, has become the new oil (or so they say). Amazon, the largest ingester (host and processor) of data, has flipped its Ecommerce model on its head, with its Amazon-Go physical stores. For the sake of grabbing juicer data about us while consuming our shopping experience, cameras installed in every corner of the store can determine where are we gazing at, for how much time, and if we are smiling or frowning. If we plot the amount of data gathered, with the increase of Customer Experience from a few CPG providers, we can read interesting trends. Obviously, the most interesting innovation in CPG is happening in the quadrant of high Amount of data AND Better customer experience. This explains why some startups are personalizing products for every customer, like Function of Beauty or Prose are doing, while collecting a huge amount of data through the questionnaires they use to understand what would be THE perfect shampoo for your hair. 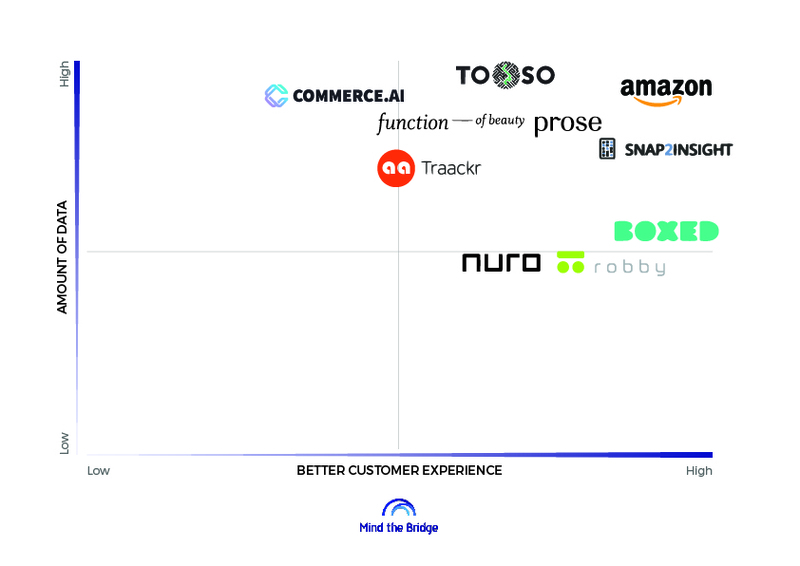 And well, “more data + better customer experience” is the same thread that binds together the algorithms that learn what customers write or say about brands, image recognition software that understand our physical, offline world, and the increasing need of big data to deploy marketing campaigns. In other words, in the CPG world, anything that allows you to have a competitive advantage on the amount of customer data that you collect, while improving the customer experience, will propel you ahead of the competition for years to come.